The HS-18 has been upgraded with even greater line capacity, while maintaining the same unrivaled power you expect from a Canyon Reel. Incredible strength and super smooth performance make the 2-speed HS-18 Plus the perfect choice for jigging, bottom fishing, drifting and just about any use that you can think of. A large, deep spool with the capacity to hold 675 yards of 65# braided line and the extreme free spool performance make the HS-18 Plus a great choice for surf casters. The HS-18 Plus is the finishing touch for many specialty rods and custom rods available today. Weighing only 29 oz., the HS-18 Plus is a powerhouse that outperforms reels that are more than twice its size and weight! 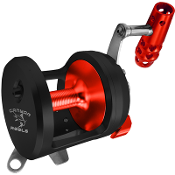 Gear Ratio: 6:1.1/3.2:1 ratio is designed for high speed jigging!